These questions, posed by the author of A Rooster’s Tale, are beautifully and tenderly answered by the young rooster, Change, who tells the story of his life, as he sits, adorable and bright-eyed, perched on a fence, one year after he and his brothers and sisters hatched under their silvery-gray mother, Margarete, in a handsome two-story coop with full access to the outdoors, including the brook they wade in and the trees they sit in, once they’re old enough. CChange’s family not only live among trees; they have a family tree, with Mama and Papa, Uncle Fritz, brother Franziskus, sister Mirabelle, Aunt Leona, and the other clan members who share and contribute to the family history and personal biography of each bird. Since A Rooster’s Tale is designed to entice and educate children and adults of our species, the chickens are humanized to the extent that Change uses verbal language to tell his story. But what distinguishes this book, in addition to the beautiful color photographs by the author that accompany the narrative, and the delightful illustrations, is that it portrays the actual behaviors, interests, and enthusiasms of chickens, through Change’s vivid account. 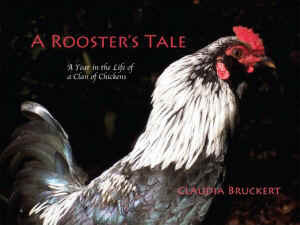 A Rooster’s Tale is “A reading joy for children, adults, and everyone who takes animals seriously.” Author Claudia Bruckert, born in Munich, Germany, lives in Northern California with her husband, 2 dogs and 20 chickens. 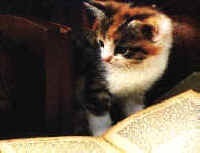 It is lovely to share their story.